Yes, this is my latest soap box issue at my house. East Texas has taken to calling me "Nancy Reagan" for my just say no to throwing out perfectly good food! GAH it irritates me to no end to throw out perfectly usable food!!!!! Ran across this at Planet Green and thought I would share. "Use it up, wear it out, make do, or do without" is a favorite adage in both frugal and green circles, and it is something I strive to live by. One of the best ways to "use it up" is to think differently about our food and ways to avoid wasting it. Lloyd wrote a great post a while back about the statistics for how much food we waste in the U.S., and the numbers are, frankly, appalling. On average, we waste 14% of our food purchases per year, and the average American family throws out over $600 of fruit per year. Most of the food we waste is due to spoilage; we're buying too much and using too little of it. We've all had it happen: half the loaf of bread goes stale because no one wants to eat sandwiches today, and the grapes we bought as healthy snacks for the kids' lunches languish in the crisper. With a little creativity, and an eye toward vanquishing waste in our lives, we can make use of more of our food before it goes to waste. Here are a few ideas for you. 7. Celery leaves usually get tossed. There's a lot of good flavor in them; chop them up and add them to meatloaf, soups, or stews. Not in my house - celery leaves are the bestest PART! d) carryout and the contents of pointless 'doggie bags' that a real dog wouldn't touch..
All of which is purchased in its 'ready-to-eat' stage, which is the most expensive way to buy food. Love the new avatar, Freek. Unforunately, yes it is that bad in the US. Some folks I know (most, in fact) never cook at home anymore except on the weekends. We have, sadly, become a Fast Food Nation. Some folks I know have really good intentions of cooking and, well, life just happens and they wind up throwing out pefectly good food that was never prepared or eaten. Here in the US some are trying what we call "the slow food movement." This means buy locally, consume what you buy, recycle or compost the leavings. East Texas (my husband) and I are very involved in this movement. It can be difficult at times but it is so rewarding to pull a carrot or potato or tomato from a veggie patch in your own back yard. Like most Americans, we used to consume wayyyyy too much meat - especially beef. Hey this is TEXAS, ya know? In the last few months, we've also cut down our consumption of animal protein as well. Now not saying East Texas will ever be a vegan (yeah that ain't happening) but he has learned that, yes indeedy, he can eat 6 ounces of steak and feel full - rather than his usual POUND! The Slow Food Movemnet is happening here in Canada as well Blue and we too are trying our best to do the same. East Texas used to only cook steak, burgers, brisket, ribs, chili, and the best stew evah! Now that he is retired, he has expanded his repertoire and cooks every night! I will admit that I "help" him by planning the weekly menu and getting together his shopping list. Other than that - he does it all by himself. I tend to cook what I was taught as a girl and use my enormous library of cookbooks. So I take over the cooking on the weekends. He just kinda wings it! He can now turn out a mean stir fry, great chicken - baked, sauteed, poached - you name it - he does it! He also cooks spaghetti (with no meat), vegetarian meals, and he has learned to make an awesome shrimp, crab, potato and corn boil like Joe's Crab Shack! Waaayyyy cheaper and much healthier than Joe's. About the only thing he doesn't do it bake - which is a good thing, if ya know what I mean? Emeril Lagasse got him interested in cooking. Remember when he was on Food Network back before Food Network was cool? Anyway, once he saw Emeril cook - he was hooked for life. Lord help me! I've created a "foodie!" I will admit that i..er have a slight weakness for my er.. Chocolate for um.. medicinal purposes! heh heh! Yeah - medicinal purposes, uh huh that's right! Me, too! That's why the stuff never hangs around long enough to be called preps! Cut this family favourite into portions so you can enjoy half now and freeze the rest for later. Preheat oven to 190°C. Grease a rectangular 3L (12-cup) capacity ovenproof dish with oil. Line a large baking tray with paper towel. Place the zucchini in a large, shallow microwave-safe dish. Add 2-3 tablespoons water. Cover with plastic wrap and cook on High/800 watts/100% power for 2-3 minutes or until almost tender. Transfer zucchini to the lined tray. Place the sweet potato in the microwave-safe dish and cook on High/800 watts/100% power for 3-4 minutes or until almost tender. Transfer sweet potato to the lined tray. Combine the ricotta, feta, milk and eggs in a bowl. Spoon 125ml (1/2 cup) of passata over the base of the prepared dish. Top with 4 of the lasagne sheets, overlapping or breaking sheets to fit, if necessary. Top lasagne sheets with half the zucchini and sweet potato slices. Spread half the cheese mixture over the slices. Top with 4 of the remaining lasagne sheets. Arrange the capsicum and eggplant over the pasta. Spoon half of the remaining passata over the capsicum and eggplant. Sprinkle with half of the basil. Top with 4 lasagne sheets and then the remaining zucchini and sweet potato slices. Spoon over the remaining passata and sprinkle with remaining basil. Continue layering with remaining lasagne sheets and spread over the remaining cheese mixture. Arrange the tomatoes, overlapping slightly, on top of the cheese mixture. Cover loosely with foil and place on a large baking tray. Bake in oven for 50 minutes or until the pasta is almost tender (when a small sharp knife can be inserted into the lasagne smoothly). Continue baking, uncovered, for a further 20 minutes or until the pasta is tender and lasagne golden brown. Cut into portions and place on serving plates. Serve with mixed salad leaves. To freeze: Make the lasagne up to the end of step 5. Set aside to cool for 1 hour. Cover with plastic wrap and refrigerate for 3-4 hours or until chilled. Once chilled, cut into serving portions. Wrap each portion individually in plastic wrap. Place in an airtight container or freezer bags, then seal, label, date and freeze. 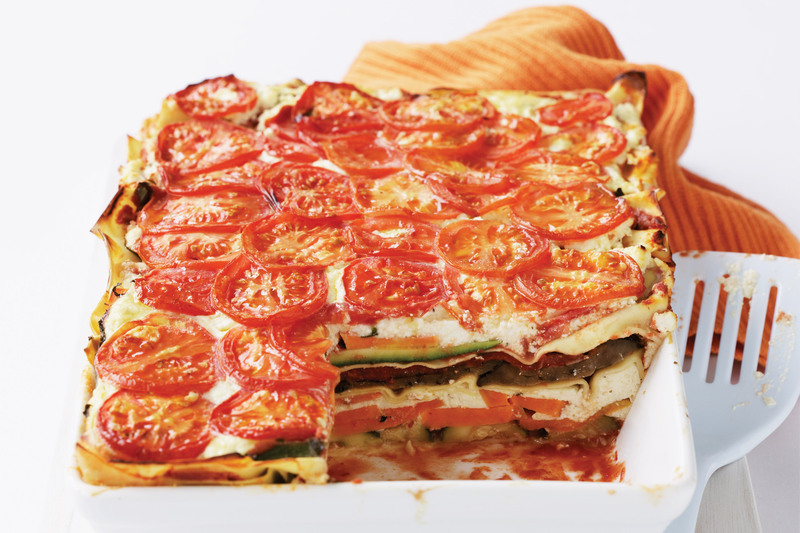 To thaw & cook: Place the desired portions of lasagne on a plate in the fridge for 6-8 hours or until defrosted. Place the defrosted portion/s on a tray lined with non-stick baking paper and cover with foil. Cook in an oven preheated to 180°C for 35-40 minutes or until heated through. Serve with mixed salad leaves. With autumn upon us at Taste.com.au, we're turning to autumn recipes, savoury pie recipes and curry recipes.